Who invented Glasses? The name of the person most closely associated with inventing Glasses is the English Franciscan friar, Roger Bacon (c. 1220 - 1292). Roger Bacon is not only famous as the English inventor of Glasses but also as a scientist and philosopher. When was Glasses invented? Roger Bacon wrote about his study of Glasses in c.1267 in his 'Opus Majus', during the Medieval period of invention (1066 - 1500), however there is no evidence that he actually made a pair of glasses. It is believed that the first form of eyeglasses were produced by monks in Italy between 1285-1289. Definition of Glasses: Glasses are defined as an optical instrument consisting of a frame that holds a pair of lenses that fit over the eyes for correcting defective vision. Fact 1: Who invented Glasses? Glasses were invented by Roger Bacon in c.1267 during the Middle Ages (1066 - 1500) era of inventions which was a breakthrough addition to advancements made in the area of Ophthalmology. Fact 2: Who invented Glasses? Prior to the invention of Glasses people just had to suffer with poor eyesight. The problem of poor eyesight was exacerbated with the advent of Christianity when the Bible and other Holy books were painstakingly copied by monks of various religious orders. Fact 3: Who invented Glasses? Glassmaking was known to the ancients and the Romans investigated the use of glass and how viewing objects made objects appear larger. Seneca the Younger (c. 4 BC – AD 65), a Roman statesman is said to have used a glass globe of water as a magnifier to read 'all the books of Rome'. Fact 4: Who invented Glasses? During the 13th century glass blowers working in Venice are known to have produced "reading stones". The reading stone was a segment of a glass sphere that could be laid against reading material to magnify the letters. Fact 5: Who invented Glasses? During the Dark Ages and the Medieval era monks believed that it was part of their sacred calling and a lifetime commitment to make ornate copies of the Bible. It could take upwards of 20 years for a monk to make just one copy of the Bible, and as the years progressed the eyesight of many monks deteriorated. Fact 6: Who invented Glasses? Given the work of many religious orders it is not surprising that the first form of eyeglasses were produced by monks to help those who spent their lives working as copyists in the scriptoriums of monasteries. Some of these monks are rumored to have held a secret knowledge of lens making and spectacles. Fact 7: Who invented Glasses? The first simple magnifying lenses to be used as glasses by monks were made in Italy during the early to mid 1200's. The spectacles were set into bone, metal, or leather mountings that could be balanced on the bridge of nose. Fact 8: Who invented Glasses? In 1267 the Franciscan friar Roger Bacon wrote about his knowledge of Glasses in his 'Opus Majus' stating that "If anyone examine letters or other minute objects through the medium of crystal or glass or other transparent substance, if it be shaped like the lesser segment of a sphere, with the convex side toward the eye, he will see the letters far better and they will seem larger to him. For this reason such an instrument is useful to all persons and to those with weak eyes for they can see any letter, however small, if magnifier enough". Fact 9: Who invented Glasses? Roger Bacon, was born on c. 1220 in Ilchester, Somerset, England, UK and died in 1292. The early years of Roger Bacon were spent in Ilchester, Somerset, England, UK where he was raised by his family. Roger Bacon was educated at University of Oxford, took Holy Orders and became a Franciscan friar. Roger Bacon was a major proponent of experimental science and achieved fame as a great Medieval intellectual. He was a philosopher, teacher and a writer. An advocate of new science he acquired a vast knowledge of the occult and alchemical traditions. Fact 10: Who invented Glasses? The invention of Glasses in the 1200's is confirmed by a document, written in 1282 from the archives of the ancient Abbey of Saint-Bavon-le-Grand, that states that a priest once known as Nicolas Bullet used glasses when signing an important agreement. Fact 11: Who invented Glasses? Roger Bacon passed his knowledge of optics and glasses on to a scholastic philosopher and scientist called Henry of Ghent, aka Doctor Solemnis. Henry of Ghent then passed the information to Alessandro della Spina, a Franciscan monk from the Monastery of Pisa, who began work on making spectacles in Italy and the closely guarded, secret knowledge of making glasses was no longer confined to religious orders. Fact 12: Who invented Glasses? The first known paintings of eye glasses was created in 1352 by the artist Tommaso da Modena. Tommaso da Modena's paintings depicts a monk wearing eye glasses perched on his nose. Fact 13: Who invented Glasses? The earliest lenses were convex lenses that bulged outward in the middle, and were used to correct far-sightedness. The invention of Glasses took a leap forward in 1451 when concave lenses for nearsightedness (myopia) were invented by Nicholas of Cusa, using concave lenses that were thinner at the center and thicker at the ends. Other experiments were taking place using lenses and the Microscope was invented by Zacharias Janssen in 1595. Fact 14: Who invented Glasses? The German mathematician and astronomer Johannes Kepler (1571 - 1630) offered a scientifically correct explanation of the effectiveness of concave and convex lenses to correct vision deficits for both the near and far-sighted making glasses much more useful to the average person. Fact 15: Who invented Glasses? In 1784 Benjamin Franklin invented the first pair of Bifocals. Benjamin Franklin suffered from both myopia and presbyopia, and to avoid the annoyance of switching between pairs of glasses to read or to see distant objects he invented a frame that held two lens sections together in one pair of glasses. Fact 16: Who invented Glasses? The use of glasses spread from Italy to the Netherlands, England, Germany, Spain, and France. The French and many English aristocrats were extremely self-conscious about wearing glasses and only wore them in private. In 1814, the Austrian inventor J.F. 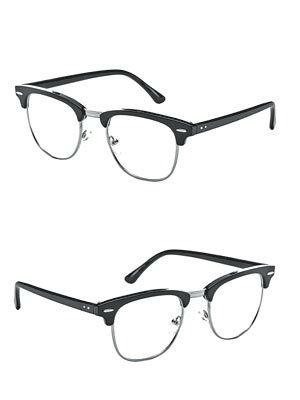 Voigtlander marketed a rimless monocle and these became the rage and highly fashionable in France and England. Fact 17: Who invented Glasses? Trifocals, eye glasses with lenses that have three regions which correct for distance, arm's length, and near vision were invented in London by John Isaac Hawkins and patented in 1827. In the same year Sir George Biddle Airy invented glasses to correct astigmatism, a form of impaired eyesight due to the irregular conformation of the cornea. Fact 18: Who invented Glasses? The Pince-nez, spectacles clipped to the nose by a spring, are believed to have appeared in the 1840's. Fact 19: Who invented Glasses? In the 1800's spectacles were sold from stores and travelling salesmen. The customer tried on different types of glasses and choose a pair that seemed to improve their vision. Fact 20: Who invented Glasses? The ophthalmoscope was invented by Hermann Von Helmholtz in 1851 which revolutionized eye care. The ophthalmoscope is a device used to examine the inside of the eye, including the retina and the optic nerve. Fact 21: Who invented Glasses? The eye chart (Snellen chart), used to measure visual acuity, was invented in 1862 by the Dutch ophthalmologist Herman Snellen. Fact 22: Who invented Glasses? The invention of the Contact lenses was made in 1887 by the German inventor Adolf Fick. Fact 23: Who invented Glasses? The term ‘20/20 vision’ is a direct result of the Snellen chart. The top number refers to the distance in feet from the chart. The bottom number indicates the distance at which a person with normal eyesight can read the same line. Fact 24: Who invented Glasses? In the 1920's sunglasses became fashionable as Hollywood movie stars began to wear them to protect their eyes from bright studio lights. Polaroid filters were invented in the 1930's and contact lenses were developed in the 1940's. Unbreakable lenses were invented in 1955 and in 1971 a new type of lenses were developed which combined the properties of glass with plastic. Fact 25: Who invented Glasses? Today, there are glasses to correct almost all kinds of eye problems and continuous research and development of new technologies will lead to further innovations in the future.